If you're a young, edible animal, a little flexibility about how you develop can save your behind. Or, if you're a damselfish, it can get a few bites taken out of your behind but ultimately save your life. The damselfish Pomacentrus amboinensis lives on coral reefs in the western Pacific, where it spends its days nibbling algae and trying to avoid being swallowed. As juveniles, these small fish have a pronounced eyespot toward the back of their bodies—a cartoonish false eye drawn on the body, like you might see on a butterfly's wing. Normally, the eyespot fades as the fish matures. Researchers from James Cook University in Australia and the University of Saskatchewan in Canada asked just how flexible damselfish are while those false eyes are fading away. Can fish opt to keep their false eyes in certain situations? And if they do, does this not-very-subtle disguise actually do anything to protect them? The scientists raised damselfish in tanks divided into compartments. Some damselfish lived alongside a natural predator of theirs: Pseudochromis fuscus, the "dusky dottyback." Thanks to the special tanks' clear windows and shared water, the young damselfish could see and smell the predator all the time. Other damselfish were raised on their own, or in tanks shared with a harmless vegetarian fish. After maturing for six weeks in their respective tanks, the fish showed some clear differences. Compared to the other fish, damselfish that had lived near predators had larger false eyes. 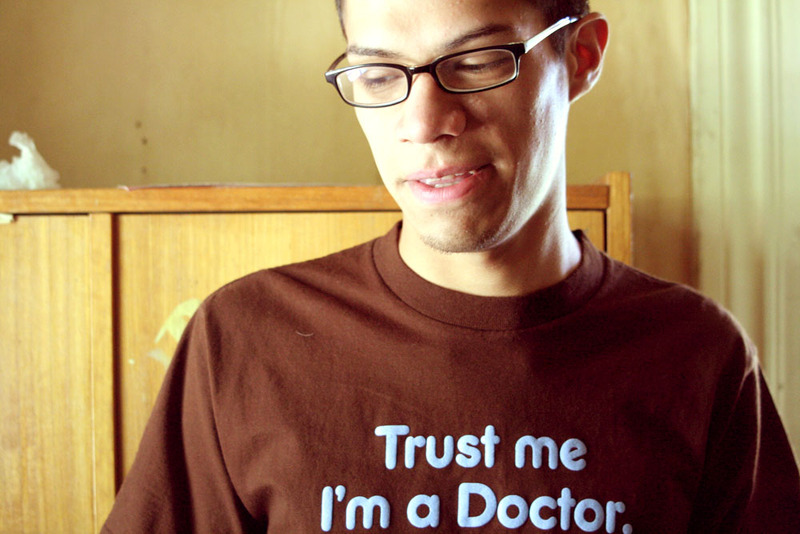 And their real eyes—startlingly to the scientists—were actually smaller. "I was very surprised by the result," says lead author Oona Lonnstedt, a PhD student at James Cook University. "It just goes to show the lengths small prey will go to minimize predator attention on their front end." This assumes that the point of all this camouflaging—growing a big fake eye near your tail and minimizing the actual eyes on your face—is to focus predators' attention on the wrong end of your body. The researchers didn't test predatory fish to see which part of a damselfish they chomped down on. But they did put the damselfish from their experiment onto isolated reef patches in the wild to see how they fared. Within two days, up to half of the control fish (those raised alone or with non-predators) had disappeared from the reefs, and were presumed eaten. Damselfish that had grown up in a tank with predators, though, radically outperformed the others. Four days after being released onto the reefs, 90% of them were still alive and well. Their large eyespots and minimized eyes may have made predators chase their back end, where a bite isn't as fatal as one to the head. These fish had also grown up taller in the spine-to-belly dimension, which gives an added challenge to hunters limited by the size of their mouths (and may give the damselfish better bursts of speed too). In the lab, these fish were less active and spent more time hiding; their reticence may also have helped them survive in the wild. There's a trade-off happening, Lonnstedt says. 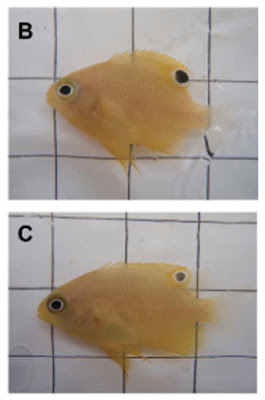 Damselfish that live with predators and grow large false eyes also have stunted eye growth, which probably impairs their vision. It's not bad enough, though, to keep them from avoiding predators on the reef. In the end, being flexible about how their bodies develop allows them to survive and swim another day.